Following an incident in which six people were injured at the Southampton Rangers that results in the club being closed so the Bermuda Football Association moved this match to the PHC Stadium. Ernest Trott gave the Boulevard Blazers early in the match, but Dion Stovell drew the Paget Lions level ten minutes into the match. Minutes before the halftime interval Tahjae Welch gave the Paget Lions the lead when he converted a Stovell pass into the back of the net. The Boulevard Blazers would draw level when Trott converted from the penalty spot. A player from each team received marching orders as the match ended 2 – 2. 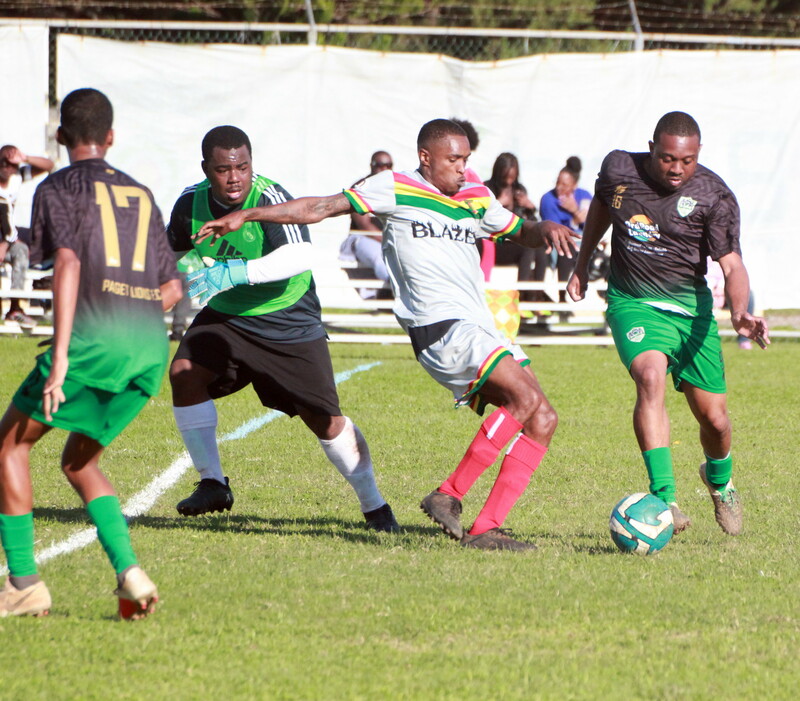 Robin Hood kept their title hopes alive picking up a 3 – 0 win over the Dandy Town Hornets at the St. John’s Field, Shakir Smith would give Robin Hood the lead in the 11th minute, Jaylon Bather would double the lead when he scored in the 30th minute. Lejuan Simmons would close out the scoring in the 65th minute as Robin Hood closed the League Leaders PHC Zebras gap at the top of the table to 3 points. Both teams needed maximum points in the relegation battle at the Somerset Cricket Club, between the Somerset Trojans and the Devonshire Cougars, but in the end the match would end 2 – 2. Damian Simmons gave the Devonshire Cougars the lead in the 20th minute, but five minutes late the scores were level at 1 – 1 when Deunte Darrell scored. D’Andre Wainwright gave the Somerset Trojans the lead in the 70th minute, but the Devonshire Cougars would get the equalizer in the 86th minute when Nyeem Simmons put the ball in the back of the net. At the Garrison Field, X-Road’s and BAA ended in a 1 – 1 draw. London Robinson opened the scoring for the visiting BAA in the 28th minute, but Donavan Thompson would equalize for X-Road’s in the 59th minute as the two teams shred the points. League Leaders Southampton Rangers earned all three points following their 3 – 0 win over the St. George’s Colts. The Southampton Rangers would go in front in the 15th minute through an own goal, the lead was doubled in the 71st minute when Cardel Henry scored and then Eziekel Stoneham would make it 3 – 0 to the Southampton Rangers with a goal in the 82nd minute. At the White Hill Field, the Somerset Eagles continue their march toward promotion with a 3 – 0 win over the Flanagan’s Onions. The Somerset Eagles would take the lead in the 8th minute through an own goal, Tahj wade doubled the lead in the 84th minute and then two minutes later Anwar Telford made it 3 – 0 to the Somerset Eagles. Hamilton Parish defeated Ireland Rangers 9 – 1 at the Wellington Oval. Hamilton Parish would get five goals from Shanye Hollis, two from Andrew Samuels, while Chris Caisey and Jokia Fox added a goal each. Daunte Woods scored the lone goal for Ireland Rangers. Two first half strikes from Teniko Eve earned the Devonshire Colts a 2 – 0 win over St. David’s at the Police Field. Eve would strike in the 2nd and 33rd minutes of the match.